The kids fishing together on the Bae river behind our old house. 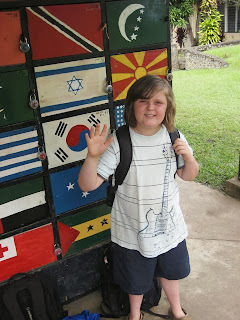 He's in 7th grade now, has his own locker. It's Saturday, chore day, chore #1 help dad clean out the chimney of the new place. Identifying and removing fire hazards is part of being on the volunteer fire-team. In moving I changed our home wireless SSID (I have encouraged the community to identify their wireless by where they live or their names, so that if there is a problem the Network Dept. can spend less time identifying the location of the broken WAP.) So... when we moved I had to rename our wireless and thus reconnect all our devices. Since I last did that, I was surprised by how many wireless devices we have. 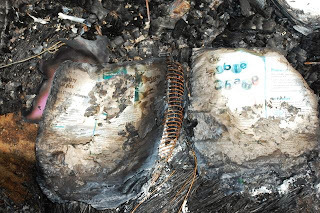 Pictured above is all our kindles (or kindle apps). !!! How did this happen? We had 1 gifted to us, and then another, and it grew, until everyone in the house had their own kindle! It makes financial sense if you're going to BUY books, for us because we don't have to pay or wait for shipping. However because all of us are avid readers, we've had to slow down on the purchasing and use free or library books. 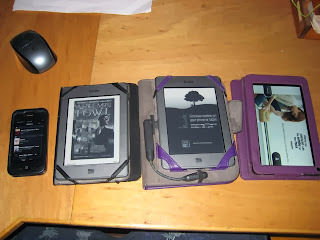 Anyway, I was surprised by how many wireless devices we had. Life has its ups and downs. Some days hit harder than others and some day's you're elated. How that relates to living overseas, is that on the down-days you pray harder and on the up days you sort of miss some friends back at home to share it with. "God am I doing what You truly want?" "God is it time to call it quits?" Our prayer has always been as support staff, for other missionaries (and ourselves) to not get overwhelmed by discouragement. When it hits, it hits hard, and being thousands of miles from your prayer support, your home church and your family can give it an extra ounce of kick that makes it sting a tad more. So my wife and I pray that God would send encouragement to people who are in these situations. Our own personal experience has been that God always sends us encouragement around the time something discouraging happens. He does that as an answer to prayer for us so we never have to ask those questions because we know with certainty we're meant to remain here and do this work! Today we tallied the cost of Chad's medivac. We looked at the extra financial gifts that have come in (thank you!) and we looked at how much air fare is going to cost us (we have to book flights to return to California in the coming weeks). We submitted all the insurance forms and got the results back... and we looked at the bank account. Basically we did bills. Who here doesn't get a little down when they do bills? Everyone does. So as I was sitting there, thinking "Okay God, we need another $7000 to come from somewhere, we trust you to supply it, now I am going to force myself NOT to be down in the mouth about this, you've always provided"
and I get an email with some incredibly encouraging news! and then I get another email with encouraging news! and suddenly I realize God is talking to us.... assuring us... keeping us calm, even exciting us. And I so wish that you at home could sense this encouragement that happens, and I hope you do. i know that your lives have the same ups and downs. And so today I offer you this bit of encouragement. there are young people, old people, children, and future children who are today, this very moment, listening and reading the Word of God and being changed by it. They are able to absorb into their souls the Words our Creator breathed into life, and it is permeating them in new ways because it's in a language they fully understand in a meaningful way. So be encouraged. Real life change is happening and you are involved. This is my current back yard. The white pipe is drainage from the showers. 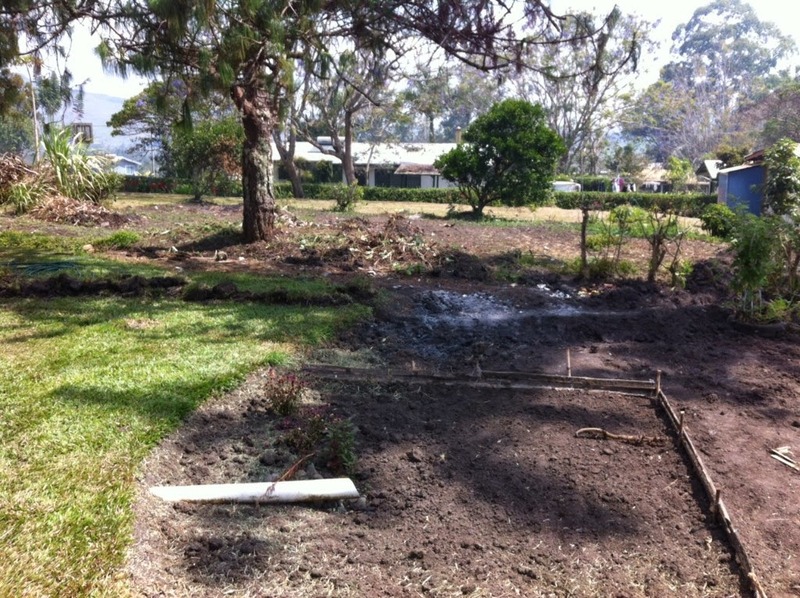 Yes, we drain soapy, dirty water into our gardens, or yards, right back into the environment. Ecologists might be very upset at this, or they may be really happy. I'm unsure. Perhaps it depends on what detergents we use, NOT the point. Landscaping is apparently a cultural thing. ALL I want is for this dirt to one day be grass. 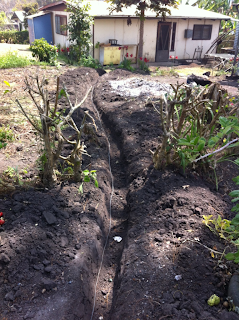 But then you have to ask 'how do you plant grass in PNG?' Thankfully I don't have to know (although I do know and have known for years). Whenever possible, part of our agreement with the government for living here, is that we will employ PNGians to do work. 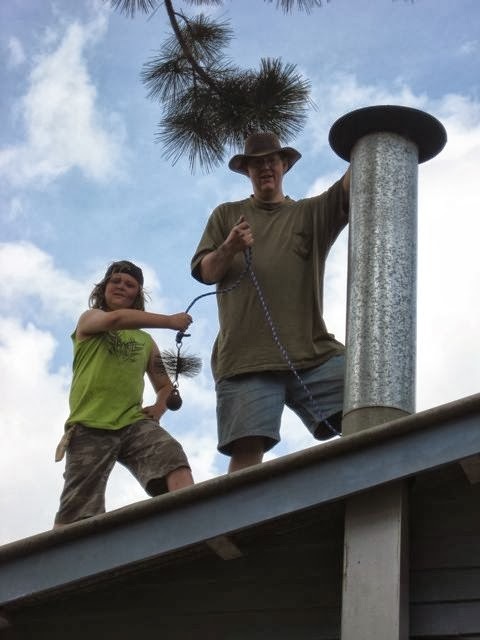 Since both my wife and I are used in ministry elsewhere, things like, weeding the garden, mowing the grass, burning the garbage, etc.... are farmed out to other people. People who use the money to feed their families and send their kids to school. The HARDEST part about this is that we have to stick to the minimum wage which is very low. It does mean you can get good labor for a low cost, but it also means when you develop a relationship with your yard helpers, and their kids, you tend to want to spoil them at Christmas or birthdays with extra food and other practical gifts (about the only time gifts are culturally acceptable to give without incurring debt). Still Not the POINT.. will I GET ON WITH IT!? So... the work of turning this dirt pile into grass, is big work. I happened to come across a lady named Opa who has assembled a crew of 7 ladies who are trying to earn up money for a church camp. She perfectly understood what I wanted, we got along well, and then I approached the topic of pay. She said that whatever I could offer her would be fair. But I know what she got paid to do similar work before, and I knew what was fair for the work. Now here's where the fun starts. Currently, we're being very tight about finances, and so, I didn't have any money to fund this project, but I also know that we can't likely leave a mess of rubbish and dirt and ash laying around. We also had several pieces of furniture to sell. Small things, like a desk, or an end table. Pieces we've collected over the years that we no longer need and that belong in a good home. Pieces that we tried to sell at a yard sell 2 weeks ago but no one purchased. Pieces that we put "FREE" signs on that no one came and took. So I said to my wife 'I think we should pay her 100 kina, but I have an idea. I LOVE any kind of financial planning that gives God the chance to do something cool... what if we said this, we will pay Opa and her ladies whatever money we make from selling the furniture and other odd bits'. I figure that leaves it open ended. If God wanted to bless those ladies with more money, He'd bring people along to buy the furniture and odd bits. So I took down the 'free' signs, and put the items up for sale on the local bulletin board. That was my idea 24 hours ago. Currently the total is 110kina, and only 3 things have sold! We're not even 1/2 way through the items I put up for sale. The idea that we're turning surplus stuff that we don't want to store any more, into cash to pay for a job we want, while blessing this team of yard meri's (yard ladies), and their church and their camp.... strikes me as the kind of economy only God can arrange. I get the biggest thrill out of watching this happen. Doh! Gotta go, I just heard the familiar ding of an incoming email that is telling me someone wants to buy yet another item. I do audio. These little plastic units you see in people's hands, that's what I do. I put God's word, in their heart language, onto these units and distribute them. I can not fully explain to you the testimonies that I hear. You can't hear the joy and tears in people's voices. You can't see them getting choked up as they explain the impact God's Word has had on their lives and their ministries, and their culture. I get to experience that. The best I can do is show you pictures and write you stories. This picture is a barret (ditch) dug from the corner of our house to our tool shed. It is an alarm wire, so that I can turn off alarms, and arm alarms remotely late at night without walking out to the shed. It is necessary because in our 6 years here, we've had our tools stolen 3 times from break ins. Our previous house tool shed was alarmed after the break ins. This wire is a specialized external twisted pair. It's meant to withstand the decay of water and time. 4 years ago I ran similar wire at our other property, only I buried it 2 feet deeper and inside of conduit. At the time the wire was not as expensive as it is now, but if you're paying $1 per meter, it adds up the longer the distance. Stay with me, you'll understand how I'm seeing God's hand in this. I decided a few days ago to run this wire. I had tried an X10 wireless alarm, and even came up with a fun Jury Rig that I blogged on how to make it louder. Once it went louder I realized it was false alarming several times a day. So, time to move to a wired alarm system. WHICH, I have. But the dollar has lost power, and we're in need of financial help right now, so I could not afford to BUY this wire. I had an idea.... I would pull the wire out of the ground (AFTER SURGERY) from my old house. After all it was in conduit right? Not happening. I was unable to pull the 2 lengths of cable out. I had wired the tool shed with smoke detectors, network, alarm, motion, door, etc. And could NOT reclaim the wiring. But in the process, I got under the house and saw about 100 yards of coiled up extra cable. 4 years ago, I had miscalculated the amount of cable I need and bought too much. And rather than cut it, I left it coiled and zip tied under the house. 4 years ago the Dollar was stronger than it is now and we were not in tough times financially. 4 years ago, God knew we were going to move in 4 years, and that we were going to need cable and not have money to pay for it. The mantra we have been saying to ourselves is that THIS IS NOT A SURPRISE TO GOD. We love our new place, but the move has set us back financially when we were not expecting it. As I looked at the need for security, and the price tag of nearly $300 to make it happen, I decided to forego the need and hope our tools and such weren't taken. but that's not the interesting part yet. I couldn't sleep well last night wondering if the cable would be long enough. I told the person we hired to dig the ditch (because I can't yet)... to make it VERY STRAIGHT... because that would be the least amount of cable needed. But the ditch has many twists and turns in it (not all pictured in this photo). I began to worry if I had enough extra cable. 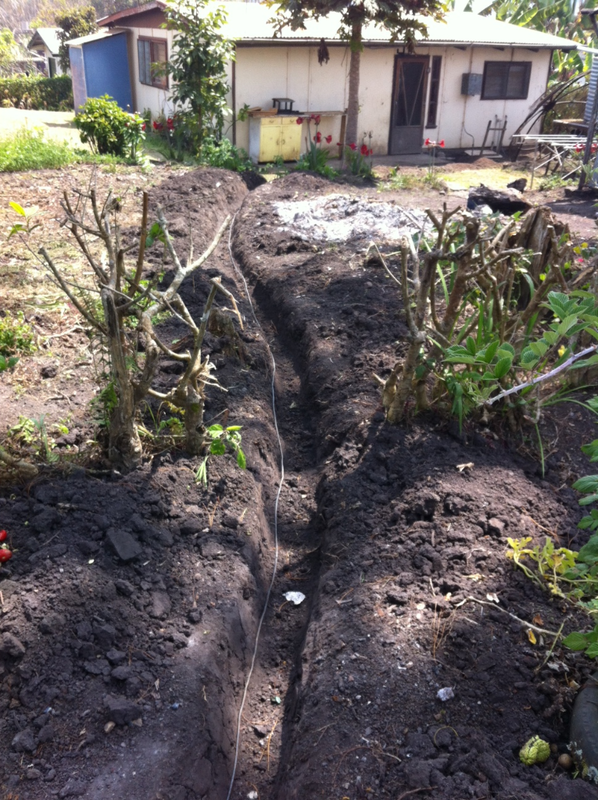 Today at lunch the ditch was done and I hurriedly ran the cable. it is EXACTLY the right length. I mean... I'm not going to cut a single inch off this thing. There is enough slack to go around ALL the curves, and to go through the wall, and up to the alarm system, and enough inches to cut and splice and even make a few errors if I have to. It is EXACTLY the right length. I don't believe in Luck, I don't believe in coincidence. And when I ran that cable it was like He was replying "See, I had you over calculate 4 years ago so you'd have free cable today, and I ordered it, exactly the right size, knowing even that your ditch would be crooked." You may think 'well if it was too short you could have spliced it'. Not with underground cable you can't. The connection will die quickly if you do. You may think 'luck, coincidence, who cares.' I care. Big time. We consider every major expense, are we being good stewards of what is given to us? Is this a wise decision? And further, I went over my notes back when we purchased the cable and told my wife, "I just can't see how I over ordered this cable! I ran the numbers three times.. I walked the distance repeatedly... how on earth did I over order?" Now I know. And I'm SUPER thankful for it and very encouraged by it. We are so used to things here, that we forget what things may strike new arrivals as ..... odd? different? what's the word... they just stand out to new folks. for example, our current store manager announces when we have received a shipment of food from outside sources, like the U.S..... he also announces when we have something in or out of stock.... If he announces that it's IN stock, it means it's been out of stock for a while. Notice, he's not saying 'This just in, New Super Brand Lucky Charms with Wheat Bits!' He's saying eggs, beef, flour .... staple foods that you might be shocked if any grocery store in the U.S. were to run out of. It's not a commentary on our store, it's just a commentary on our daily life style. Also notice he had to mention that while it was coming IN STock, that it would take time to put on the shelves. It is not uncommon for word of mouth to carry so quickly that people arrive at the store before the staff is able to put it on the shelves. "Did you hear, they just got a shipment of white flour in!... let's go, it's Friday, the store is closed all weekend, we should go now!" OF course management of the store is a difficult task, and it affects everyone who lives here, so it's a highly public task as well. Thankfully we've had good management for a long time now. Which means I've only heard stories and never lived through them. Nothing like that has happened in a long while. 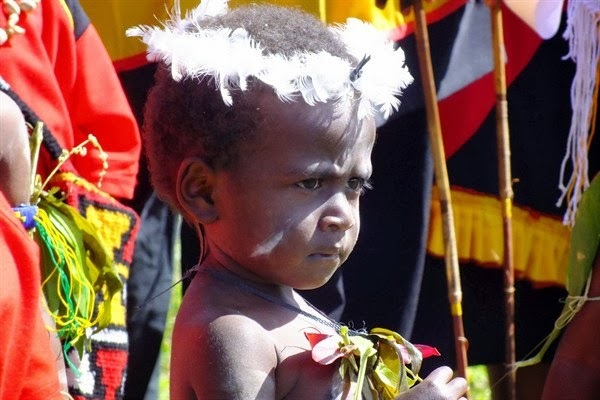 This child is dressed up for the PNG independence day celebration. Notice the lack of smile. Having worked in Children's ministries for years before coming here, I have all kinds of tricks up my sleeves to engage kids, make them smile and laugh, make them sit and listen, etc. Upon arriving in PNG one of the things I noticed that many people had not, is that at a very early age, PNGians learn not to smile, and then a few years after that, they scowl. They don't do this because there is bitterness in their hearts. In fact I don't know why they do it. They have tough lives, and culturally a smile is not considered polite. In the U.S. when you smile, it's polite, you smile and wave hello, and you don't stare. Instantly you'll feel the culture clash when you visit PNG as you notice, smiles are rare, furrowed brows are common, and people have no problem staring. It doesn't mean to them what it means to you. It's not impolite, it's not anger, in fact, in some tribes, smiling while showing teeth, is an act of aggression. Anyway, as you can imagine, it makes my heart sad to see children reach the age where they stop smiling, stop giggling, stop laughing. But, it does it that much MORE delight when they do laugh and smile (which happens, just not as often as you'd want). So whenever I get the chance, I like to make the kids smile and laugh. Even if I'm just passing them on the road. 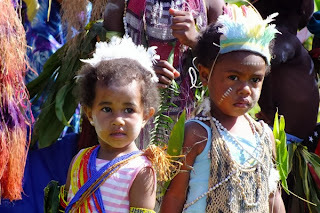 Some of my most memorable moments are when I've been in the middle of a crowd of hundreds of Papua New Guinean children, and they all suddenly start laughing in one huge voice. Sydney and I were involved in a puppet show some time ago. 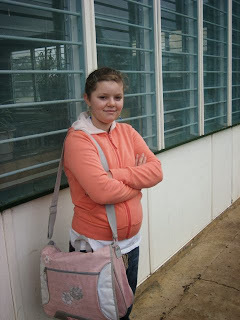 I was security and videography, Sydney was one of the puppet actors. 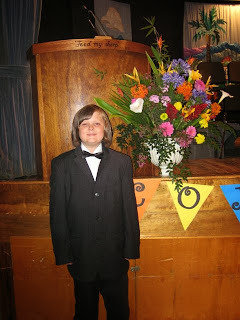 There had to be 700 PNG kids there, and I was standing in the middle running a video camera on a tripod. And suddenly... this thunderous laughter happened all around me.... it was so awesome I was nearly moved to tears. The kids were so attentive to the Gospel story presented by puppets. Something that we used maybe 10 years ago in Children's ministries.... that today would barely hold the attention of a U.S. kid for 15 minutes. They were hypnotized for over an hour..... laughing, singing, listening. It was something to behold. It hasn't rained, seriously rained, here in weeks. Our water tanks are drying up. As I think I've blogged before, one of the local beliefs or traditions is that when things are dry, they should burn the wildgrass, as the smoke goes up and convinces the sky to rain. IT's also a great time to burn grass in preparation for planting a garden. What happens when it is dry, is that the dirt roads give off more dust.... there is always smoke in the air, and depending on how big and nearby the fires are, there are bits of black ash falling from the sky around you. If you've ever approached Los Angeles from above, you see the hazy smog that covers it, and yet, when you're down in it, you don't see the smog. The smoke and dust and ash is so thick here today, that you see it. You're aware that you're breathing it in. As a result, the clinic tries to keep a lot of inhalers on hand. But when the rain comes..... (hopefully it will soon).... the air smells clean, all the dust is washed off of the slowly dying greenery, the roads aren't dusty, the gravel sinks back in, and our tanks fill up. When the rain comes, you realize that you can't speak to someone next to you as the noise from the metal roof is so loud. We hung decorations today. Kendal made this decoupage of our name from letters she bought in Cairns. 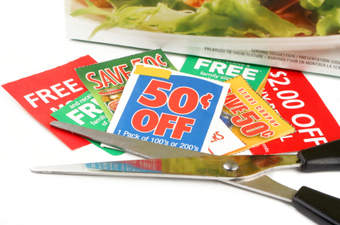 So I'm watching this show 'Extreme Couponing' and wondering 'is this gluttony or is this creative use of money?' I see all these people with these storehouse of product that if we can get here, it's expensive. 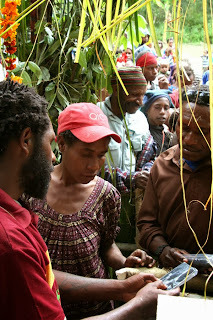 Do you know that here in Ukarumpa, we pay anywhere from $8 - $25 for a box of breakfast cereal. As you can imagine, suddenly Lucky Charms becomes as rare as Caviar and we're rarely eating it. On the TV I see a basement filled with such boxes that they got for free. And part thinking 'they are abusing the system and breaking the law' (dumpster diving in California is illegal). but then I had this whole new thought. If people were to apply this skill and donate the food to the homeless, to missions, to churches, not only would they get the tax benefits, but people in PNG could afford cereal! My mind started racing about a ministry. People who live in home countries, and work the couponing system, and then donate the food to missions locations to support the folks there! So I thought 'maybe someone else had this idea.' and Googled 'couponing for Christ'. Wow. apparently there is a whole lot of debate over whether or not this behavior of extreme couponing is ethical or not. HE bought something like $2000 worth of cereal for $3 or something, and then loaded up a trailer and hauled it to a charity. Syd:" calvin i like the line in this song that says shake it like a Polaroid"
Syd:"it's from when they had to shake pictures to develop them in the olden days"
Me " I am in the prime of my life at 40"
Syd " really? I think the prime of someone's life is around 20 or so not when they're old like you"
Me " I am going to remember that comment for later. At 20 you're barely out of the womb". ago, and we're hosting a party tonight. oop... they just all cheered for something, I think I'll go check out why. house.... we had a ton of people stop by to say 'hi'. It is amazing how social this place is compared to where we were. As the kids age their chores get harder. My daughters job was to build an herb garden fence using all used materials. My son and I pulled out some hibiscus hedge with the truck. It seems the word is out that the GIANT no longer lives there, and the abandoned neighborhood has had vandalism and theft already. 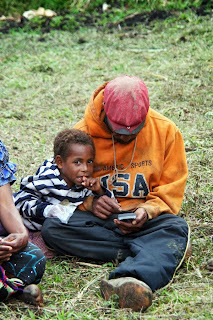 My neighbor, Adam works with the Enga speaking people and keeps a very good blog at http://pngboyd.blogspot.com.au He catalogs the details of life with the Enga in PNG, quite well and has a knack for explaining things clearly. He wrote the following, which sadly, is not a unique case in the highlands of PNG. In fact, at any given time, some clan is at war with some other clan. Fighting is all around us, and after nearly 7 years here, we've become used to it. It's a horrible shame, people are killed, houses are burned... and it's a regular occurrence in areas that have not been changed by the Word of God. 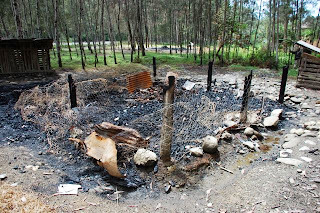 During our time in Enga Province, eleven houses were burned down in the village of Sakarip, which is where two of the Enga Bible translators live. 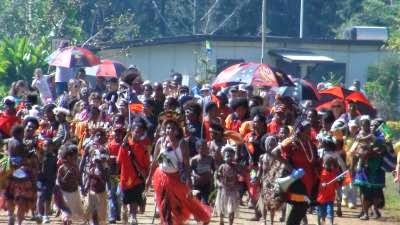 We took the time to find out the cause of the fighting, and we wanted to share what we discovered with people here in Ukarumpa. In order to understand the causes of this particular tribal fight, it is first necessary to understand the tribal structure of those involved. 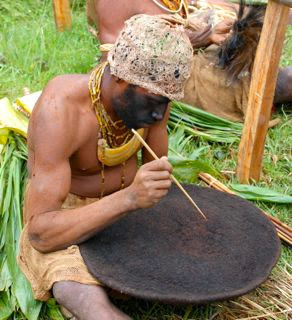 The tribal system in Enga is hierarchical. 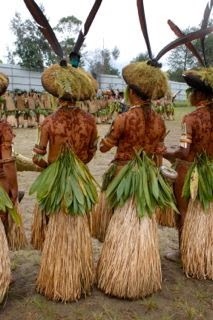 There are roughly 100 large tribes in Enga that are then broken down into sub-tribes, clans, sub-clans, and family lines. The particular tribal fight that was happening during our time in Enga took place within the Potealini tribe. The Potealini tribe can be broken down into the following hierarchy (only lines that are relevant to this fight are shown). During the summer of 2012, Papua New Guinea held its national elections. One of the candidates for the Wabag Open Seat was Paul Pandan, who belongs to the Wambyen clan. 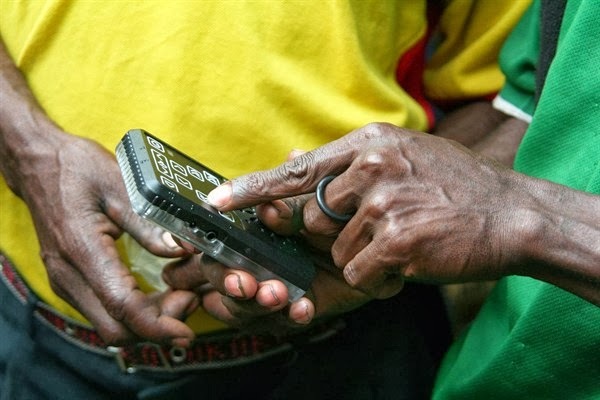 Nikolas Mangen, an Engan accountant in Port Moresby, who is a member of the Pepatae clan did not vote for him, even though it is usually expected that a person will support any candidate from his own sub-tribe. A few weeks later, Nikolas Mangen got into an altercation with two men from the Wambyen clan, who killed Nikolas by chopping his head with an axe. The cause of the fight was the fact that Nikolas did not vote for Paul Pandan, who was the Komboto candidate. At least some of the men were drinking, which contributed to the fight. In accordance with Engan custom, the members of the Wambyen clan began to pay compensation to the Pepatae clan because of the murder of Nikolas Mangen. This willingness to pay compensation paved the way for peace between the two clans for a year. After a year, however, some Wambyen men, who had been drinking, went into Pepatae territory and stirred up trouble by saying things to provoke the Pepatae sub-clan to fight. When the Wambyen men left, the Pepetae were so enraged that they pursued the Wambyen men and killed one of them. At that point, the Wambyen declared war on the Pepatae, and all of the people from each clan fled into neighboring sub-tribes to seek refuge, particularly the women and children. Some of the Pepatae sought refuge among the Langape sub-tribe, who live immediately to the east. The village right on the border of the Pepetae territory, is Sakarip, which is where two of the Enga Bible translators live. 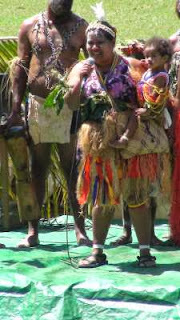 In particular, Sakarip is where people of the Mupa clan live. As the war between the Pepatae and Wambyen went on, the Pepatae proved themselves to be superior fighters. killing 6 Wambyen men. It appeared that the Pepetae had won and the Wambyen had lost, and so there was a period of peace. After a couple of weeks, however, a Pepatae man was killed when he was alone in a field and the fight erupted again. The Wambyen later discovered that two young men from the Mupa clan were assisting the Pepatae in the war. 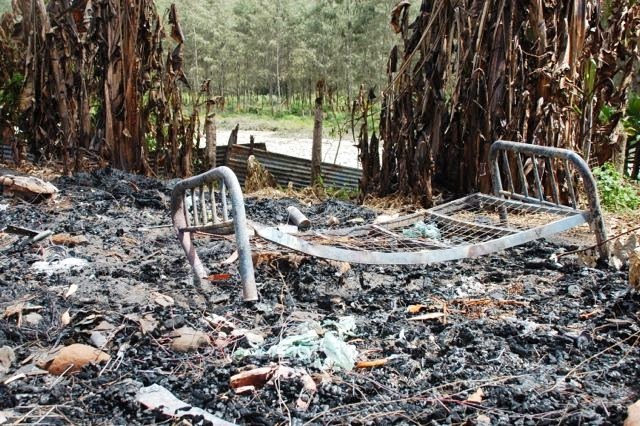 As a result, the Wambyen came into Sakarip and burned down the houses of the closest relatives of the two young men. In all, eleven houses in Sakarip were burned down, and at least seven pigs (which are highly valuable pieces of property in Enga) were stolen. As a result all of the women and children left Sakarip and sought refuge with neighboring clans in other areas. Now at the same time a man of influence who sympathized with the Wambyen has supplied ammunition, machine guns, and mercenaries who are skilled in operating machine guns. The Pepatae see that they are now outmatched, and they have fled even farther away. However, the mercernaries are still roaming through Sakarip with machine guns, especially at night, looking for enemies from the Pepatae clan. This was the state of affairs when we left on September 10. When we visited Sakarip after the houses had been burned, it was clear that people did not have much time to flee. 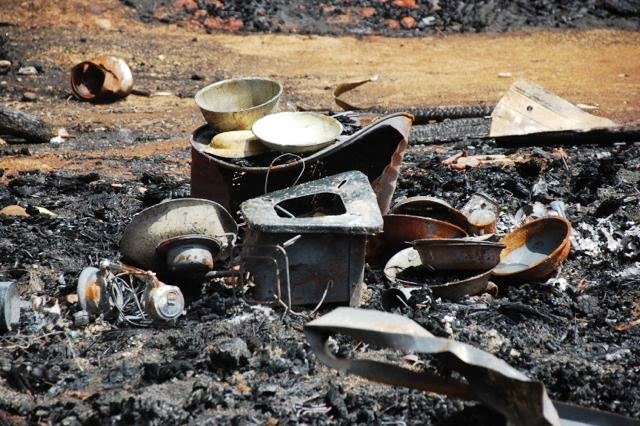 As we looked through the charred remains, we found charred school books, lanterns, cooking utensils, and even a metal bed frame. Other signs of the war were evident. 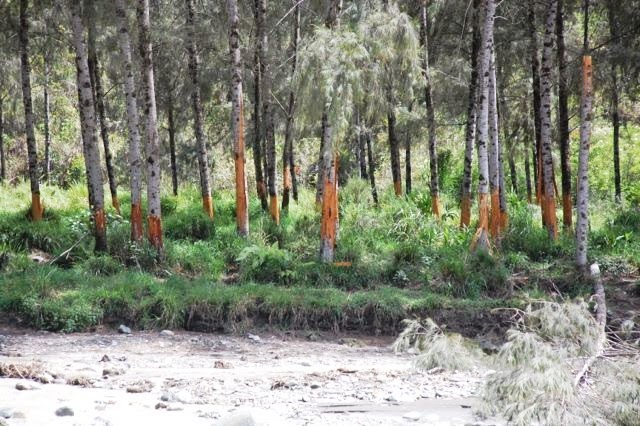 Just across the Lai River in Pepatae territory we could see dozens of trees that had no bark at the base. 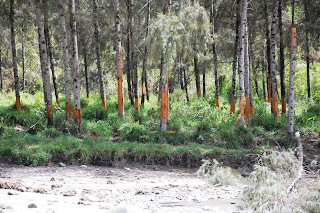 The Wambyen had removed the bark to kills the trees, which is another tactic of tribal warfare. By killing the trees, the Wambyen make it difficult for the Pepatae to have a supply of wood for fires or for building new homes. On the day when the houses in Sakarip were burned down, Maniosa Yakasa, one of the Enga Bible translators, was driving from Wabag town, where we work, back to Sakarip (a 20-minute drive) to drop off his family. He was stopped by a police officer, who told him that there was fighting going on in Sakarip and that he could not continue. Maniosa came back to Wabag town, and he continued working on the translation without a break. Ruben Yonasa, the other translator from Sakarip, although visibly shaken, also continued in the translation work. Both of their homes were spared although seven of Maniosa's pigs were killed and two kunai houses on his property were burned down. Maniosa and Ruben are still sleeping in Sakarip, but their families have fled and are now also living as refugees in other villages. 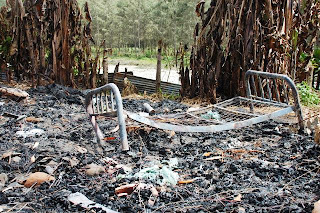 Unfortunately this scenario is not an isolated incident in Enga Province. This sort of fighting happens all over the province all of the time. 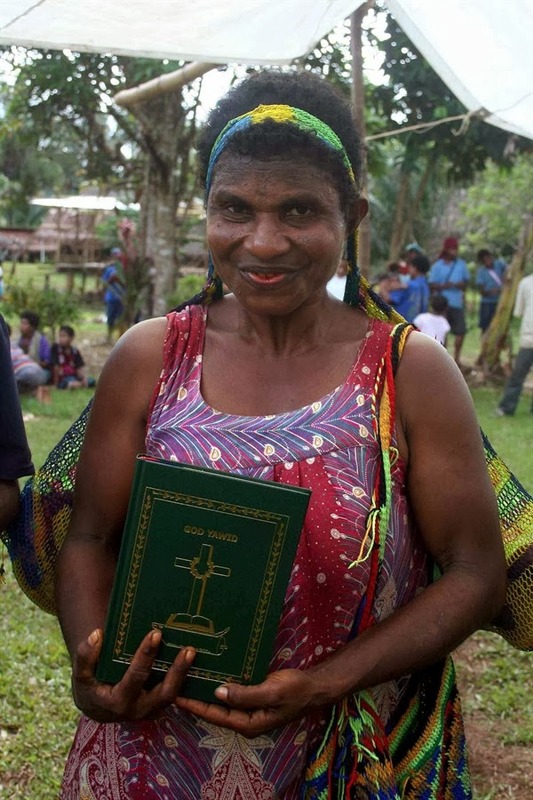 This is one of the reasons why the Enga people so desperately need the Bible in their own language. They are stuck in a cycle of violence, and they don't realize that there is another way based on love and forgiveness. Please pray for the fighting to cease and for God to speed our translation work so that people can be exposed to another way of living that doesn't involve fighting. The message is not getting through in English and Tok Pisin. With your prayer support the recording went very smoothly. I got back to the studio and the trouble began. denied. It was time to remix. re-submitted it, and was approved. get the final DVD's to them quickly, but it didn't play out that way. I am convinced it was spiritual warfare, and I thank you for your prayers. to go out the door. how it's impacted the culture. be handed to the people! expect and hope it to do incredible things in the Ura speaking people. Please pray that this tool causes a huge impact for God's kingdom). 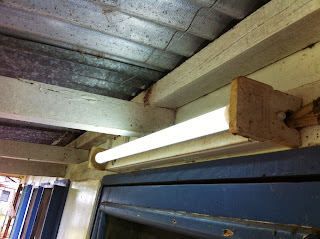 This is an LED tube installed in a security light. Our house has security lights around it, that are activated by a Daylight sensor such that they only come on at night, and go off in the morning. The purpose is of course, to keep raskals from having a dark secluded place to take their time breaking into your house through a window. Also, to keep you from getting surprised by someone jumping out at you at night. (women don't usually walk much at night because of this risk). A few months ago, our electronics guys discovered these LED tubes that you can put in the fluorescent lights. We run almost exclusively fluorescent lights to save on power draw. Electricity right now is more expensive than gas. Which means we run generators to make our own instead of drawing from the power at the local hydroelectric dam. An LED bulb reduces the amount of power draw by a huge amount (close to 90%). They last ten times as long as a normal fluor. tube. But they cost about 10 times as much. This means less bulb changing, less power bill, and good bright security. And not only do they help us, they help the neighborhood with less draw on the generators. All this you probably know because I blogged it a while back. We were early adopters of these bulbs and showed them to friends, and now, dozens of homes are equipped with them. One thing we noticed was that the light is a bit harsher. Another NICE thing was instant on! A normal fluor. light will take a second to start lighting, then strobe and flash. Not only is that unfriendly while going to the bathroom at 3am.... but it's not as secure because it blinds you for a few seconds when you walk into a dark room. Enough time for someone to jump you. Instant on is very nice to have!.. and you save money after about 10 months... it's all gravy!!!! special thanks to friends who helped us buy a large portion of the bulbs!!! Problem: No telephone jacks in bedrooms. alarm panic button, deadlocks on the door, and ..... no telephone!!!! emergency numbers ON the phone AND beside the phone, etc. The kids drilled for earthquakes, fires, and... yes... invading rascals. call for help for the kids and any babysitters. self-defense items/alarms in their pockets. YES I'm serious about security. should they ever, they'll be able. the previous owner ran speaker wire all over the house from the office. happened to have several telephone cables.. SNip Snip.. splice splice..
tape tape.. bingo, a phone in every room that had that speaker wire. electronic geek's workbench you know what I mean. get the job done. And you think "yeah, it's all worth it"
pillage to splice together something useful (albeit ugly). 1km away from the old one, and are now unpacking boxes and such. chewed through wiring, etc)... keep the lights on... keep the place secure. This the previous jury rig post. The X10 Protector Plus is a low end, mediocre, wireless alarm system. I have a shed in my yard about 300ft from my house. can't be heard from inside my house while I'm asleep. here, for me to be able to wake up to. (with speaker wire) in a 12v siren/bell. (super loud over 120db). I cut a hole in the ceiling to conceal it all. Tools used: leatherman 'charge'. That's it. for.... secured the shed for pennies! Now, when the alarm is tripped, its VERY LOUD. will hear an ear piercing 1 second SIREN. That will allow it to be silent. On the left you see the typical plastic strapping that comes around boxes that are shipped. Most people cut the straps off, and throw them away. 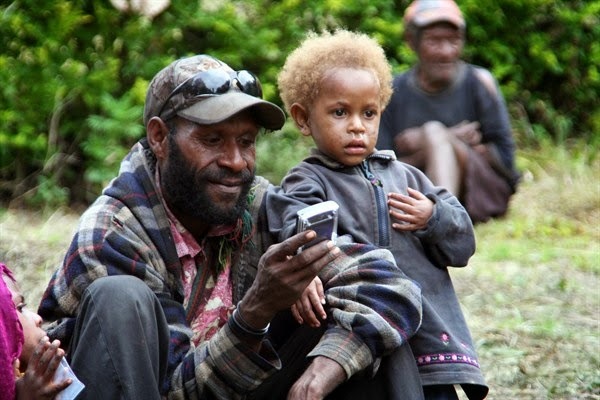 But in PNG, one man's trash is another man's treasure. (but as my son says 'Sometime's that other man sees it as trash too dad'). Instead of throwing out the strapping, when I come across it, I keep it and give it to our PNG friend Iri. She makes bilums with them. (The plastic is the spine/base/beginning point of the bilum) She makes them during her lunch break, or whenever she is sitting down waiting. 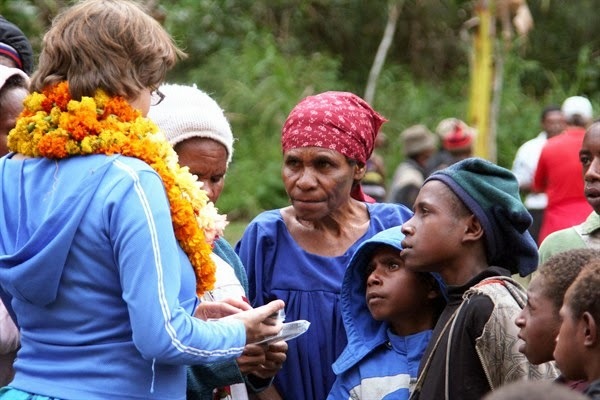 There is a lot of waiting in PNG. Waiting for rides (PMV's) waiting to sell your garden produce at market, or just sitting around talking. The difference between this hobby, and say something like cross stitch, is that the Bilum is something that can be gifted or sold. They sell for around $25. 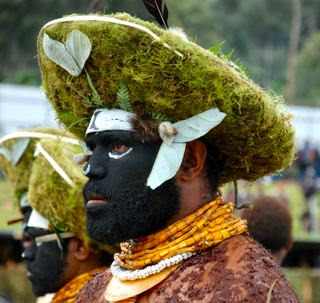 Each region of PNG is known for their color schemes and make. Some put frills on the side (called Bilas) some put lettering in them. I even know someone who had been their favorite Baseball team logo stitched in. 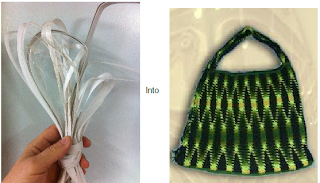 The bilum is a remarkable bag. It's colorful, but also very strong, and very flexible. They stretch to hold everything you put in them, and then reform to their original size when empty. The bilum is often given as a gift of honor and respect. At a recent Bible Dedication, the ladies who had given 20 years of their lives, each received 8 bilums as gifts. The number of bilums, who they came from, the decoration (bilas) the color, all give measures of gratitude and respect. 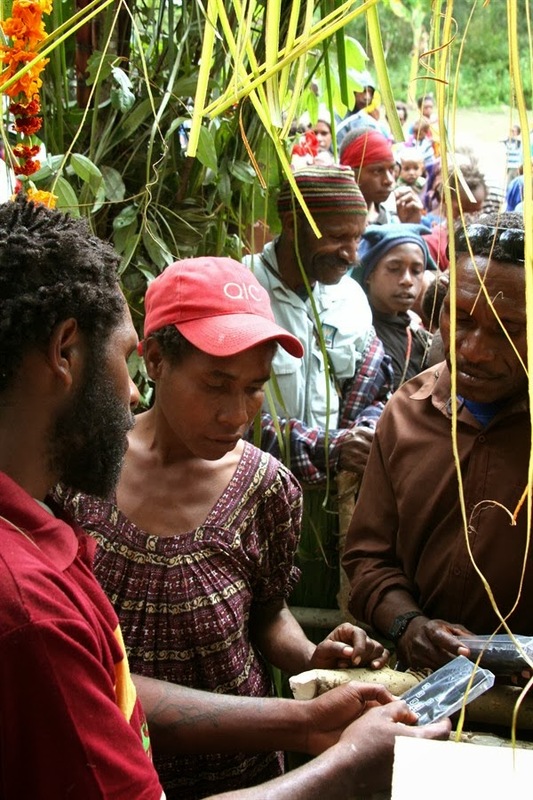 There are two things which challenge the American male idea of sexuality in PNG. The first is that male friends, hold hands. (men and women don't hold hands.... this cultural moray is changing rapidly, but traditionally only men hold hand with men, and women with women). They hold hands while they talk. If you reach out to shake someone's hand in PNG, be prepared to not let go for a while.. (long past the time that would make most American men uncomfortable). They walk hand in hand down the street as they talk. The second, is the carrying of a bilum. It may strike an American man at first, like a purse. I told myself I could never get used to carrying one, daily. And I don't. But I did get used to carrying one when I had things that didn't fit in my pockets. I was given one, and I purchased one to commemorate a hike I took through the highlands. Everyone knows that bilum is a highlands bilum because of it's color and style. I use mine to transport tools, often. If I need to do a quick run up the hill on my ATV, I can throw my hammer, drill, screwdrivers in there, and throw it over my shoulder and I'm gone. When you drive a motorcycle or a quad, a bilum is a useful thing. The other day, I had my bilum over my shoulder but under my coat to keep it's contents dry. Someone happened to begin a conversation with me and said 'I'd never be caught dead carrying a bilum it makes me feel......' at which time they noticed I had one over my shoulder... and they stopped talking immediately. I laughed pretty good at that. It is funny the things you grow accustomed to. Things that used to rub me the wrong way about this culture, I've since learned to love and work into my daily routine. Words I use forgetting they aren't English, foods I eat that used to make me queasy. So, I do carry a bilum (not daily but whenever I need to), and I am used to holding hands with men, and I do eat beef crackers, and I do say 'maski'. And I'm not ashamed of it, nor do I feel wierded out by it. In fact, I rather think the bilum is a nice thing to have. I no longer carry a wallet, or a watch, but I do carry a bilum from time to time. It is really exciting what God did in Sissano last week!! Praise God for about 40 students in the workshop! · We only had 24 copies of the book Luke/Acts to sell (the rest are still coming from Wewak). Praise God all of the copies sold and people were still asking for more! 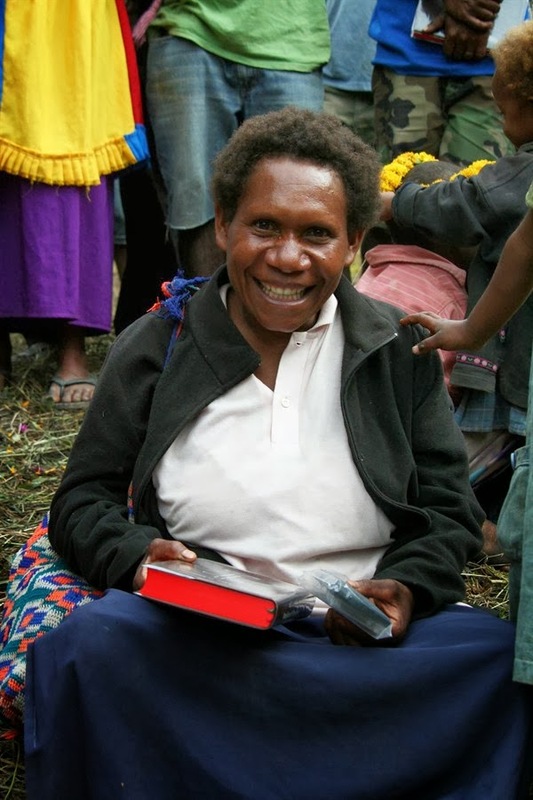 · Praise God 9 AudiBibles sold (we took another 21 back with them to Sissano to sell because there is so much interest). 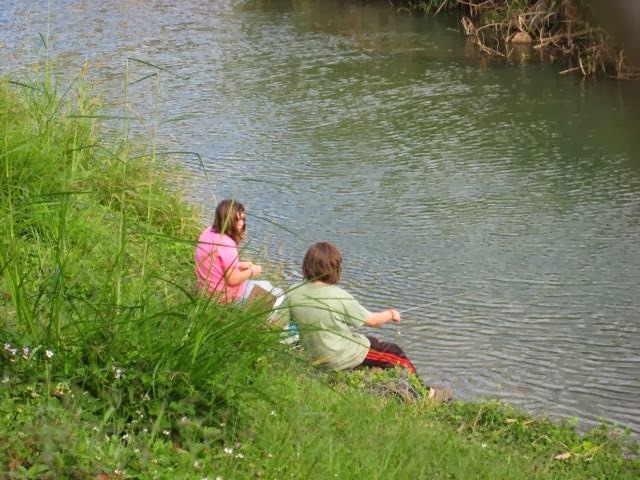 · Praise God for 2 Sabers selling (they are the players for the churches). · Praise God for how excited people are – everywhere there were people talking and talking about reading and hearing God’s Word IN THEIR LANGUAGE! · Pray that people would continue to practice the good start they got in reading God’s Word in their language. 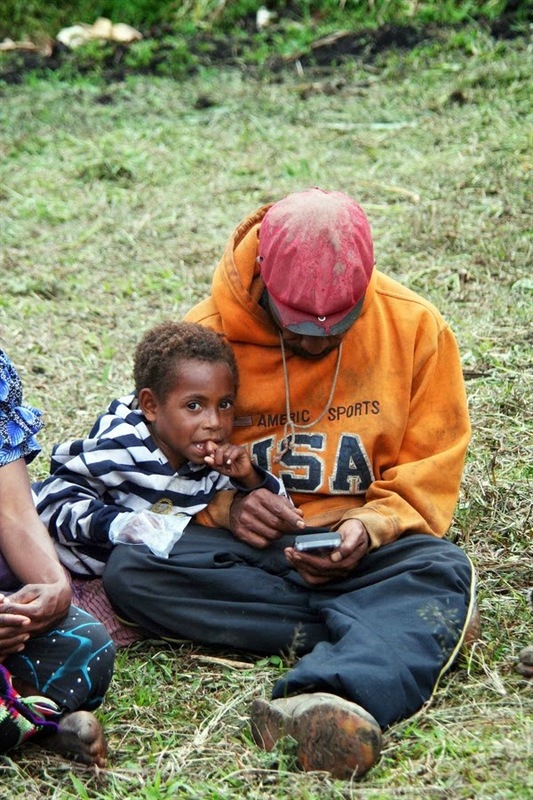 · Pray that people would be drawn to hear God’s Word in their language on the players. I tell you, the post production on this DVD has been almost nightmarish with how many things have gone wrong with it. -Rendering the video on the Mac, which is normally a rather easy thing, was very complicated. The ratios, the codec, nothing seemed to be compatible between the original video, Final Cut Pro, and DVD Studio Pro. I ended up, for every episode, going through a 3 render process. Then open it in DVD Studio pro and create the DVD menus and burn it - render 4 hours. I had to do this 16 times. -Second pass audio was approved, but then I had to go back into the rendering loop above which I had completed a month before. -We had power issues and the UPS system went down and so did all my network attached storage, so all my renders were corrupt and/or render was interrupted. ?Why are you using network attached storage? A. Because I have no space on the local machine, I've patched together a rendering box as DVD mastering is not something we do a lot of here. It's hobbled together and I think next time I will outsource it. ?Why are you using a Mac? A. Well, the P.C. software suite is Adobe and it costs like $1500 for the software that would all work. I started on the Mac because I know the DVD Studio Pro software, and it was easy, the only problem was.... for some reason, the video doesn't like to talk to the other apps.... primarily because the video came from a Windows machine and the codecs and ratios, and all of that seem to confuse the Mac. It's the first time I've ever seen it at this level, and I figured it all out, but it took a while to get it to all jive properly. EVEN without any more errors in the mix, it'll take me at least another week of straight rendering before I can think about producing a DVD. Please pray that there are no more.... 'incidents' as it may in fact be a spiritual battle going on here.